As the middle of winter approaches, flu season begins. This winter is no exception. We have assembled a few suggestions to help you prevent flu this season. because the influenza virus that causes the flu mutates frequently causing this year’s flu virus to be slightly different from the previous years’. 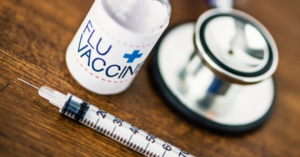 By always receiving the most recent year’s flu vaccination, you can reduce flu illnesses, doctor’s visits, flu-related hospitalization, and missed work. The more people that receive the vaccine, the more people that will be protected from the flu. Cover your mouth and nose. This may seem like a no-brainer, but it is easy to forget. When you cough or sneeze cover your mouth and nose with a tissue or your elbow. Try to avoid using your hands to cover unless you immediately wash them afterwards. Clean your hands. Wash your hands often with soap and water. In a pinch alcohol-based hand sanitizer is also a quick and easy way to keep the germs away. Avoid touching your eyes, nose, or mouth. Even if you clean your hands frequently, there is still a chance some germs could remain or get picked up after you touch objects like a cellphone, keyboard, door knob, etc. Clean and disinfect frequently touched surfaces. Surfaces like the ones mentioned previously, along with others at your home, work, school, etc. should be cleaned often as a way to help eliminate the number of germs. Avoid close contact. Distance yourself from people who are sick. And vice versa, if you feel you are becoming ill, avoid close contact with others so you protect them from becoming sick as well. Practice good health habits. Get enough sleep, drink plenty of fluids, manage your stress levels, be physically active, and eat a nutritious diet. These activities will help boost your immune system and help you fight off germs.